Join us this Friday night for Open Mic Night and celebrate National Ice Cream Month! Maybe you could sing a song about your favorite flavor? Join us as we meet with neighbors and friends to share our talents and ideas. 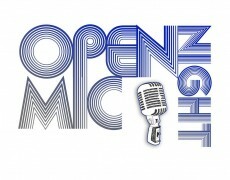 Open Mic Night is your night, your night to express yourself through song, poetry, story-telling and dance! Don’t forget to bring a friend or a neighbor! $2 donation suggested at the door. We look forward to seeing you tomorrow night! !